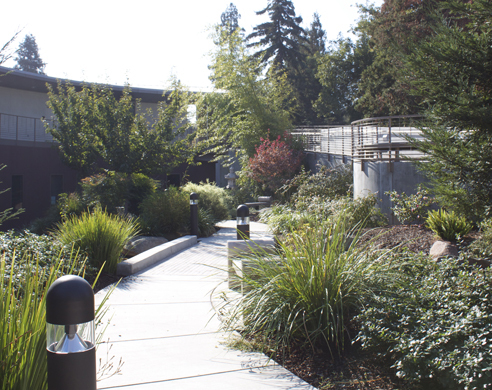 The campus is Disneyland for botanist and eye candy for gardeners. As Delta was being constructed, botany instrucSteve Stocking envisioned a campus that flourished with various plants that would be labeled to create an outdoor lab. “Dr. DeRicco, who was an administrator at the time of the planning for the new campus was interested in trees and his support was very important in the planning of plantings,” said Stocking in an email interview. In fact, Stocking still works as an unpaid consultant, and has for the past 10 years, on the current contract to refurbish the plant life on campus which has suffered over the years do to a lack of maintenance. “For upkeep of the area it was essential to have the co-operation of the groundsmen for upkeep. With staff cutbacks it became more and more difficult to maintain the area,” said Stocking. According to Paul Ustach, a botanist instructor and one of the consultants for this project said he expects to see this project done later this semester or at the beginning of spring. The refurbished nature trail will feature various zones to make it an outdoor classroom. Some of the new zones include redwood, chaparral and oak woodland. “It’s going to be refixed maybe not to its former self, but refixed,” said Michael Toscano, horticulture instructor, employed here since 1995. During the early years of of the nature trail, a booklet was sold on campus which students could use to identify different plants by number. “Over the years the booklet has gone away,” said Toscano. But it’s something most people take for granted. In fact according to Toscano, students and visitors alike trample over plants to create shortcuts on campus. It’s especially a problem for student planters who are graded on these plants, that later find the projects destroyed. “Students will cut through plants,” said Toscano. “They think its beautiful and they want to admire it but they don’t want to respect it,” Toscano said. It’s one-third of the financial problem the nature trail faces while interested parties work to rebuild it. It is also costly to replant squished plant life over and over again. The other two-thirds of the problem are irrigation and a lack of staff. While the school’s worry about funding and Prop. 30 floats around this upcoming election, the campus prepares itself for a $6 million cut, which has left Delta with fewer groundskeepers. The issue isn’t that the nature trail won’t be refurbished, but shorty after being completed there won’t be enough people to properly manage it. “If it’s not being upkept, the biologist will be out there,” said Ustach. The future of the plant life is still uncertain at Delta, but Toscano will keep pushing this project until it’s finished and his students will keep working after the project is complete. With donated money, Toscano makes roughly 15 plaques, denoting plant types, at a time to carry on the legacy of Stocking. “Steve has the nature trail, but I’ll have the signage,” said Toscano.